Show off with this Alilang statement bracelet! Inspired by the nature and the beauty of spring, this cuff adds just the right touch of both elegance and fun to any outfit you are wearing. Chic, yet trendy, it can be worn with everyday clothes, or be the perfect addition to a semi-fromal to formal outfit. 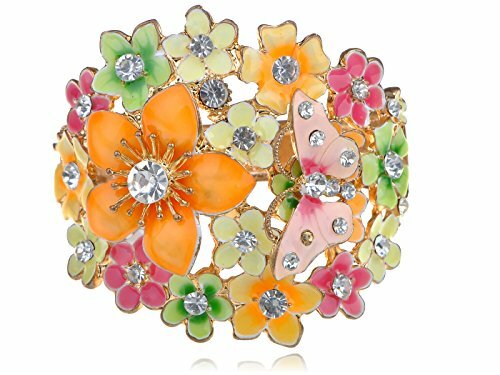 This Alilang multicolored floral rhinestone bracelet is just what any fashionista's jewelry box needs! MAKE A STATEMENT. This gorgeous cuff bracelet features beautiful 5 and 6 petal flowers in many shapes and styles. A delicate butterfly floats over one of the flowers, as if just passing through. Clear crystal rhinestones throughout give off just the right amount of sparkle. This unique, hinge closure bangle will turn heads! BEAUTIFUL MULTICOLORED DESIGN. The glamorous clear rhinestone crystals add lots of shine to make this bracelet pop. The enamel painted flowers feature a variety of both vibrant and pastel colors. Colors like grassy green, goldenrod, lemon chiffon yellow, and deep pink mix together to create a mesmerizing floral design. The pale, ballet slipper pink butterfly contrasts perfectly against the many colors of flowers. PUT A SPRING IN YOUR STEP. This charming bracelet is just what your spring wardrobe needs! Freshen any outfit with this gorgeous floral bangle. Add this to a casual, everyday outfit like jeans and a t-shirt for a touch of charm, or pair with a little black dress or blouse and skirt, and make your outfit unique. Wear for brunch, dinner parties, weddings, and more!